Perhaps the simplest measure of engagement that ISPs track is your open rate. A high open rate indicates to ISPs that the user wants, or at least is interested in, these messages and will therefore continue placing them in the inbox. Clicks, however, are not a metric that affects your deliverability. This makes sense given that some messages can be informative and may have few links on them. If you have a high open rate but a low click rate this could indicate that you have a good email reputation but not so good on your marketing strategy. You may need to rethink your design and offer strategy to get more people to click through to your site. Other positive actions that ISPs look at are: whether or not the sending email address has been added to a safe list of recipients (i.e. is a designated trusted address), the message is moved to a folder for personal organization or archiving, and of course marking a message as "Not Spam" when it does land in the Spam folder. These are all actions that indicate to the major ISPs that the recipient cares about these messages and wants to see them in the future. These can easily be taken care of with a Welcome message that reminds users to add the sending address to a safe list, suggests the user move messages they like to a folder for future reference, and asks that the user mark the message as not spam if they received it in their spam folder. Perhaps the most obvious negative action a user can take on your messages is to mark or move it the Spam folder. Another action that may not be as obvious is if the user deletes the message without opening. A couple of these and the messages will start placing in the Spam folder rather than the inbox. Check out our recent blog post regarding Pre-header Text on how you can use it to get some of your message across prior to the user opening the email. It's important to realize that not everyone will be reading your messages all the time, and not everyone will want to see your messages even if they signed up to a related newsletter or website. Set up a proper opt-in process that sets expectations for the user of the frequency and content of the messages they'll be receiving, and make it easy for them to opt-out as well. It's better to have a user unsubscribe from your messages (and hopefully provide feedback on an opt-out landing page) without marking you as a Spammer. 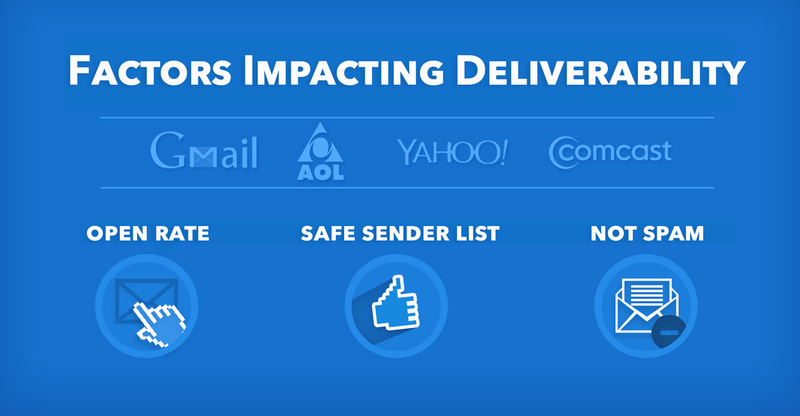 You'll also want to avoid purchased lists as these can generate high amounts of Spam complaints that could hurt future deliverability. It's also important to remember that Inbox placement is mostly personalized. Some users on the same mailing list will constantly receive messages in their inbox, while others will see them in Spam. Past behavior will dictate where a message lands in the future, which is why Welcome messages and setting expectations are so important. If you notice your open rates drop, take a look at which addresses have previously not opened vs. those that recently stopped opening. Did anything change in your messaging content, frequency, or design since the trend started? Overall it doesn't hurt to keep sending to long term non-opening addresses, however you'll want to change up your email strategy so that they end up re-engaging with emails in a positive manner rather than hitting the spam button.